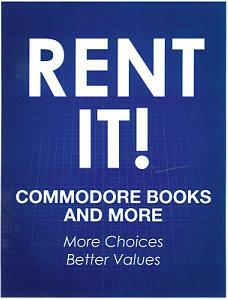 Commodore Books & More is now proudly offering Rental Textbooks!! There are many options available to you when it comes to securing your textbooks, but none are easier or more cost-effective than renting your textbook(s) from Commodore Books & More. Pick up your rented textbooks at Commodore Books & More without having to pay shipping and handling fees. Taking notes and highlighting is permitted unlike other online options. Keep your books for the entire term and conveniently return them to Commodore Books & More after your finals. NEW – Regardless of payment tender, a credit card must be used to secure all rental titles at the time of renting. I understand and accept the responsibility that at the end of the current semester, it is my responsibility to return the book rented under this program or pay the replacement price of the unreturned book. I understand that the book rented by me is the property of Commodore Books and More and in accepting the terms of the book rental program, I will return the book in good saleable condition as determined by Commodore Books and More. All CD’s and other component parts included with book must be present and in saleable condition. I am responsible for the risk of loss from any cause including, but not limited to theft, loss of item(s), or return of book in unsaleable condition caused by, among others, liquids, fire, chemical spills, tooth marks(rodent, pet, etc.) missing pages/components, and spine damage. Damaged books will not be accepted and renter will be charged replacement cost for damaged item. I understand that books must be returned, or if shipped received, by the listed due date. If my book(s) is(are) NOT returned by the due date; or is(are) returned in unsaleable condition, I authorize Commodore Books and More to withdraw/charge the debit/credit card account used to secure the rental for the difference between the rental price and the purchase price as the replacement fee. If they are unable to bill the card on file, the fees will be transferred to my student account which can result in the withholding of grades and transcripts until payment is made. I have read and fully understand the provisions and the terms of this agreement as outlined and I agree to adhere to all conditions and terms stated.